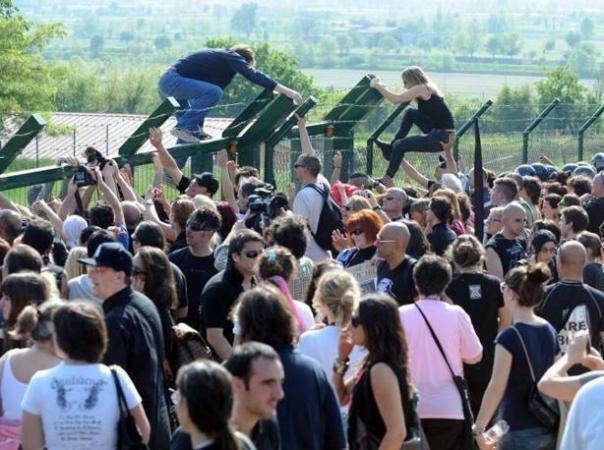 At least 1000 activists organized by Occupy Green Hill who came from all over northern Italy started their procession in Montichiari, a city about 60 miles east of Milan where Green Hill is located. Many of them wore signs saying “We are the 86%,” referring to the percentage of Italians polled who were opposed to animal-based experimentation. On their approach close to Green Hill they were met by police and roadblocks. Groups of activists then cut through the fields and across other streets to the fences surrounding the facility. There, about 300-400 demonstrators tried to open gates in the perimeter as teams of mobile riot police and police who were deployed tried to contain them. On the side of the gates, however, the protesters opened a breach in the fence and broke into the farm, with others simply scaling the fence, carefully avoiding the barbed-wire. 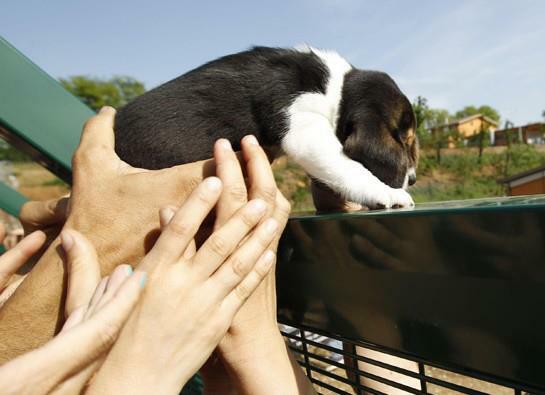 Once inside they scrambled into the sheds and rescued at least thirty dogs, many of them being handed over the fence to waiting hands on the other side. At the end of the day, it was reported that police had arrested 13 people. Some protesters said they had suffered violence by some officials. View video of the march and the raid here. Several years ago Marshall Farms Inc., an American firm, acquired the company. Marshall is infamous throughout the world as the largest “producer” of dogs for the vivisection industry. The Marshall beagle is actually a standard variety. For about €450-900 ($600-1200) you can buy dogs of any age. For those who are willing to pay more one can also obtain a pregnant mother. Green Hill and Marshall also offer its customers on-demand surgical treatments, such as the cutting or removal of vocal cords so “researchers” cannot hear their cries of pain. 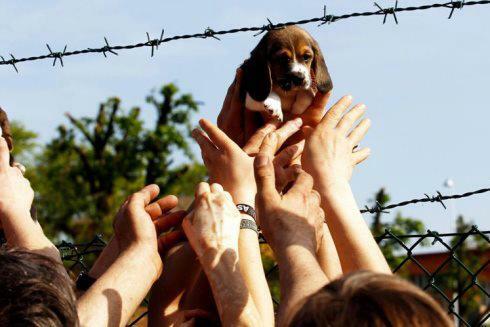 Responses to "VICTORY - Courageous Italian activists save 30 beagles from animal testing labs"
It is time that all animal testing laboratories worldwide are attacked and destroyed! What a great action! It made my day! God bless you, dear italian activists! the humans in it into prison for a lifetime! and let us be the hope for these abused animals! OTHERWISE NEVER EVER ANYTHING WILL CHANGE!!!! Bravo j'espère que maintenant ils vont être vite adoptés. et surtout plus d'essais sur les animaux voila un autre sujet de campagne!!!!! Si ça se produit dans le 06, je serai avec vous. Ich sitze da und heule....meinen größten Dank diesen Menschen !!!! God bless all of you and let's say what the vivisection people think about doing that to their children! This is hell! leider wurde jedoch wohl nur ein winziger Anteil der Tiere dort gerettet.